Sometimes you are writing some codes and things really come together well. Let’s imagine, you are writing a little tool in ApEx for registering hours on a project. The hours are recorded in a table which contains all days of the week and a week number (and employeenumber and projectnumber). 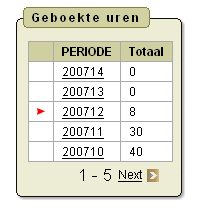 One region on the page shows all weeks in the vicinity of the current date, including those which have no recorded hours and thus do not exist in the registered_hours table. That’s a good thing to start with, we can create any set of weeknumbers we like. But, for some weeks there are records in the registered_hours, and we want to use the above query only to ‘fill the gaps’. So we have two resultsets. But how do we combine them? A simple union does not give the proper result, as totals will be always 0 for the first query. And minus doesn’t do the trick either, because this will only make the gaps bigger! The first select in the UNION is the resultset in the registered_hours table and returns real data. The second select is the result of the set of weeknumbers MINUS the weeknumbers we already have. This set resembles exactly the gaps we had in our data. UNION them together (we might even have used UNION ALL of course) and we’re done! Well, almost. Wouldn’t it be nice if we showed a little indicator in ApEx which record is the current one? You probably seen this a thousand times before, but it’s such an elegant example of the little tricks you can use in ApEx, like coding html tags in the query. So we add an extra column to our query which shows an image where the period in the selection matches the current period in the page. ( select CASE year_week WHEN P3_CURRENT_PERIOD THEN '<img src="&IMGDIR.arrow.gif"' ELSE ' ' as "x"
select CASE year_week WHEN P3_CURRENT_PERIOD THEN '<img src="&IMGDIR.arrow.gif"' ELSE ' ' as "x"
So far, another day at the office!